How do we become more authentic? Horses open the door to our authenticity, self-love and a deeper understand of ourselves. 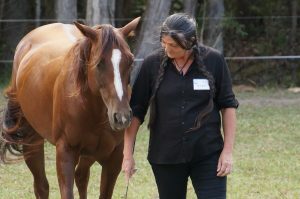 Let horses be your guides on your journey to awakening your Authenticity! In this exciting and transformative 2-day Workshop you will experience unique activities that are focused on developing and cultivating authenticity. Horses are powerful teachers because they are always authentic in their self-expression towards others. This workshop will open the door to your authenticity and allow you to integrate this wisdom into everyday situations. Experience or knowledge of horses is not required. Even people with a fear of horses can benefit from this work. What a lovely weekend of discovering yourself in such a special, meaningful way! Years of therapy wouldn’t bring about the same realizations! Thank You! Ben and Linda are genuine and beautiful people. They made this experience enjoyable and easy. The weekend has helped me in many ways. Enjoyed the journey to authenticity – excellent info, exercises shared in a safe environment. Very well presented at a beautiful location. Note: We are currently working on online payment options. To book, please select one of the options below and enter your preferred payment method in the comment box. We offer Direct Deposit and Paypal. We will then send you an email with further instructions.